We all remember middle and high school history courses and the hours spent coloring maps. I remember there were restrictions about having to color each adjacent countries a different color. In 1852, a young man named Francis Guthrie noticed that when coloring the counties in England, only four colors were needed. He then wondered if this is true for any map. This started a chain of events that lead to its proof more than 120 years later! 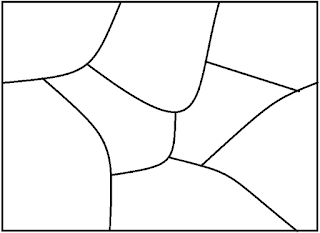 There have been several proofs offered by notable mathematicians but all had been insufficient for a formal proof. It wasn't until 1976 when two mathematicians, Kenneth Appel and Wofgang Haken used a computer to finally prove the four color theorem by showing that there are certain number of map configurations and that all required no more than 4. Now, you may be thinking what a waste of time. But this is remarkable in that this was the first time a computer was used to prove a mathematical conjecture. If you have ever tried to color in a coloring book or better yet at a restaurant coloring the placemat given to your child, you're going to need at least four colors to make sure that whatever you're coloring will have distinct color for each outlined area. 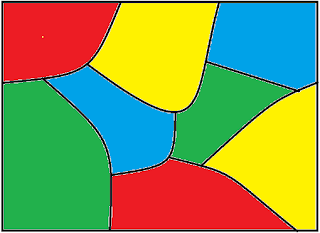 And next time you're wondering how to color an abstract drawing like the following, just use this simple diagram..
You picked your 4 colors and start to color and all of a sudden, you realize that you need another color so that two of the same colors won't be touching each other. Luckily, you made a copy of the original line drawing so you can start again, but you want to be smart this time and plan. Hmm, how do you plan? You can put tracing paper over your line drawing and draw a circle inside each area and connect the circles to each other where they touch. 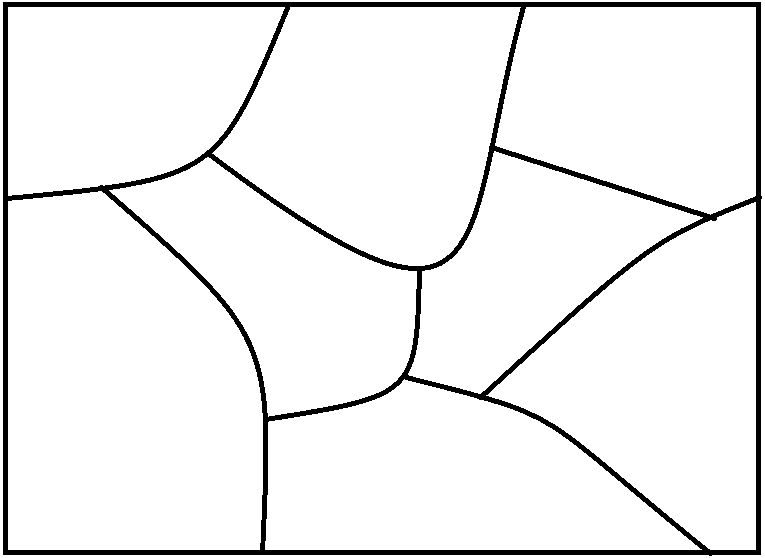 Now, you have a simplified model of your line drawing. 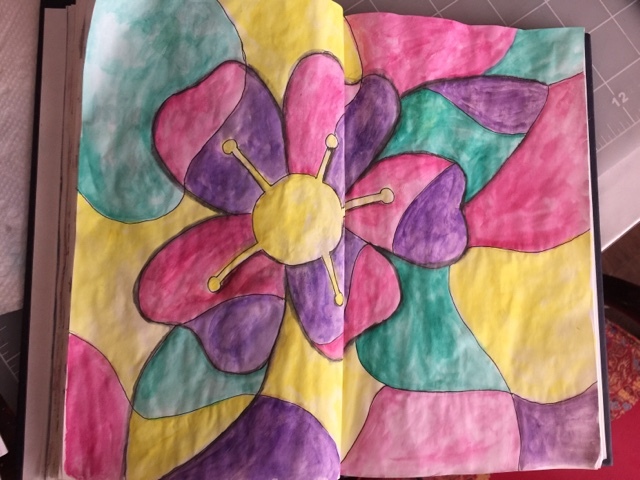 All you do now is to start with one circle and color it in and add colors to the circles that connect to it. 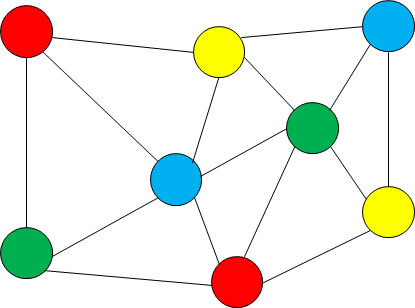 You can use the same colors as long as it does not appear in your connected circles. So it may look like this. 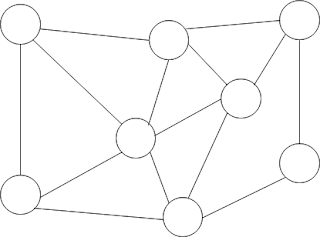 And now, you can color your line drawing. There are many excellent articles that shows more of the proof. Here is one. It's been awhile since I've posted. In fact, it's been awhile since I've created any art. So here's what I've been up to lately. Perhaps some of you know that I went back to teaching after many years of being a stay-at-home mom. I thought I would ease into it by substituting for a math teacher who was having surgery. For a week, I taught Algebra, Geometry and Precalculus using prepared lessons, interacting with students, rediscovering how much I loved teaching. And then, the school asked me if I wanted to teach my own classes. The school needed a teacher for IB Math Standard Level. It is a two year course that covers trigonometry, statistics, and AB calculus. Were they crazy? Was I crazy enough to take the position? Of course! And so began my crazy return to teaching which has taken over my life. It's been two months and I'm finally beginning to feel like I can breathe. And it's my spring break! Though I still have plenty of things to keep me busy, I wanted to get back to doing art again. IB stands for International Baccalaureate and without going into detail, the IB Math that I teach is a two-year course covering trigonometry, statistics and AB level calculus. One of the interesting part of this program is that students must write a paper that explores the math concepts they learned in class in real life. My seniors are working on topics ranging from statistics in sports to mathematics of Islamic geometry. 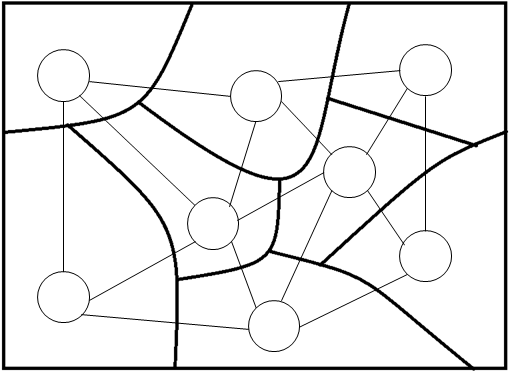 And so I thought I would focus on some connections between art and mathematics this week. 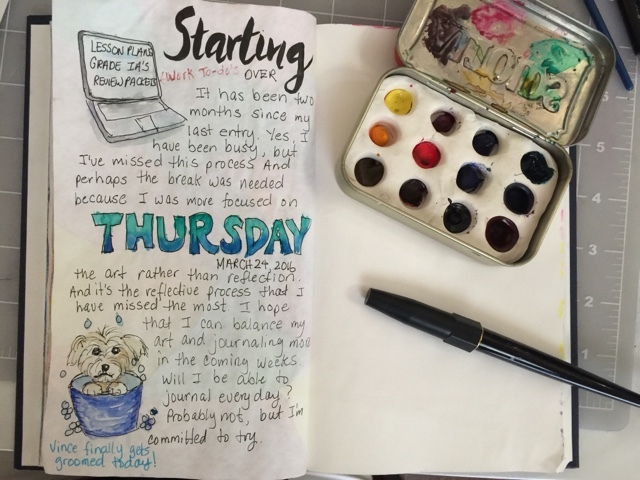 If you have been following me on this blog, you know that I love zentangles. It is a stress reliever for me to just doodle some favorite patterns without worrying about what I'm creating. There have been many nights that I would simply pick up a pen and began drawing patterns in my notebook just to brain-dump so I can sleep. 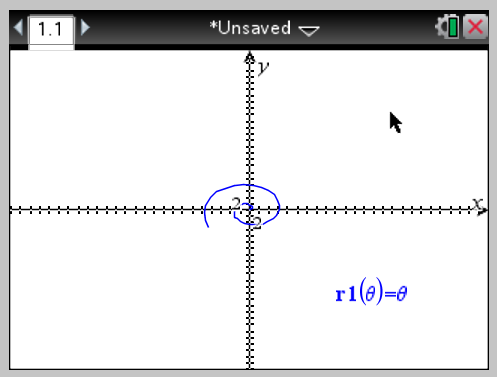 Last week, my precalculus students worked on a project about graphing polar equations. 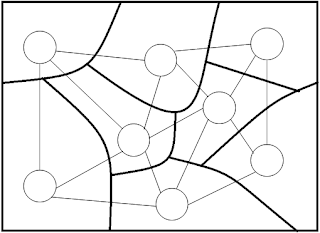 You must remember graphing points and equations on a rectangular or Cartesian coordinate system. 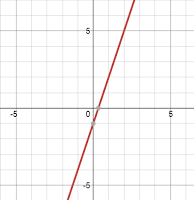 The points are placed on the graph based on the distance away from the two reference lines called the y-axis (vertical) and the x-axis (horizontal). This is the system all of us learn in school. There is another coordinate system that uses the distance from the reference point (the radius) and an angle from a reference direction. This system is called the polar coordinate system and is often used to graph cyclical equations. 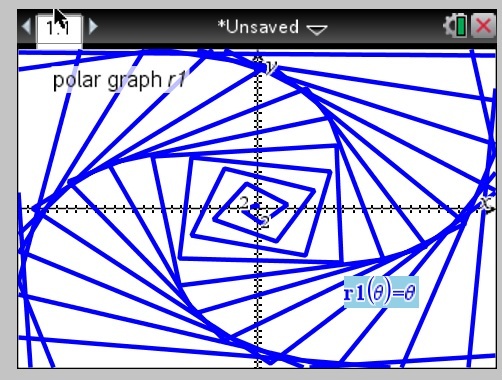 I'm not going to bore you with the details, but here are some cool polar graphs. The last one is called an Archimedes spiral and it's what I used to graph my zentangle pattern. My original attempt on my TI-Nspire graphing calculator looked like this. I increased the number of revolutions and also increased the step size (how often the calculator puts a point and since I increased the step size, it puts the point less frequently). This made the spiral less smooth. 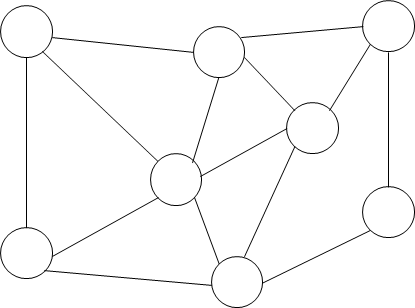 To get the original graph that looks like Rick's paradox, I did 80 revolutions and used a step size of 6.5. 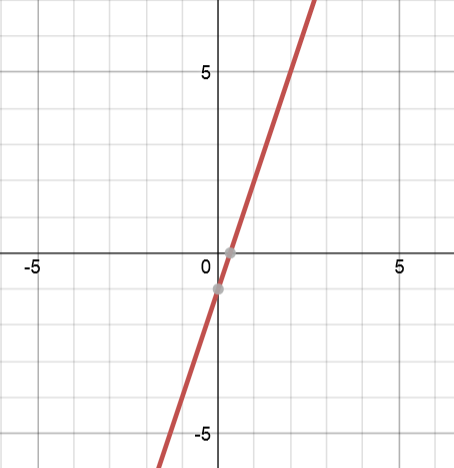 Using a simple polar equation r = Θ, I was able to create a replica of Rick's paradox. Pretty cool! And here is an old zentangle piece I did using only Rick's paradox.. 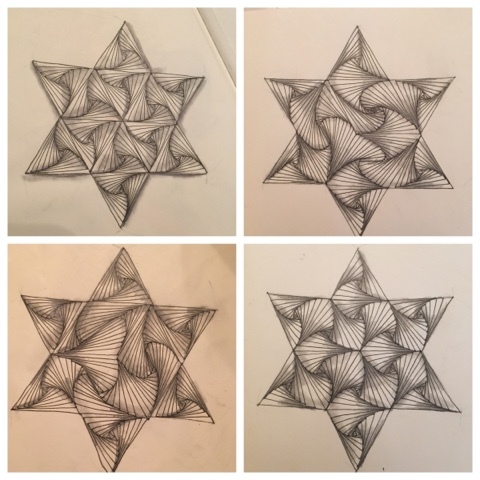 I hope do more math-inspired art this week! Stay tuned!